A group of Vermonters, including Justin Sinkevich, at right holding a sign, rallied in Montpelier last week in opposition to a carbon tax. While some lawmakers favor the concept, leadership in the House and Senate are resistant to the idea..
“I set the rally up to put the legislators under the Golden Dome on notice: This will not be a solitary event. We will continue to return here. And our numbers will grow,” said the rally's organizer, JT Dodge of Newbury. 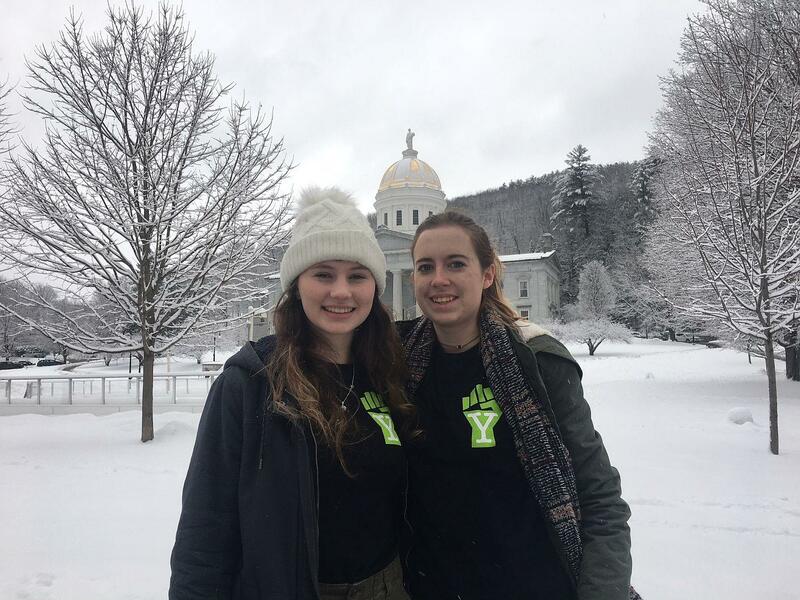 Harwood Union High School seniors Orielle Koliba, left, and Libby Brusa, are part of a statewide organization, called Youth Lobby, that's calling on lawmakers to "put a price on carbon." Winooski Rep. Diana Gonzalez is one of the many lawmakers who supports a tax on carbon pollution. She says elected officials can look at what happened when gas prices spiked to more than $4 a gallon a few years ago to understand why the carbon tax might be an effective policy. Influential environmental organizations like the Vermont Public Interest Research Group long ago began making the case for a carbon pollution tax in Vermont. And as annual greenhouse gas emissions continue to rise, other groups have joined the call. This week, Audubon Vermont voiced support. And even as Dodge and his fellow protestors urged lawmakers to squelch the carbon tax last week, people like 18-year-old Orielle Koliba were sending the opposite message. “I think that putting a price on carbon will incentivize using renewables, and switching to electrification,” Koliba says. Koliba, a senior at Harwood Union High School, is a member of the Youth Lobby, a student group trying to put climate action at the top of lawmakers’ legislative priorities. “I think that it’s important that we don’t just dismiss it. We’re not saying right now that we know the solution. But we’re saying we don’t want to say, ‘No.’ We want to be open to options. And we want to work with legislators to make those options happen, because we can’t just keep going the way we’re going,” Koliba says. Vermont’s carbon footprint might be tiny compared to other states. But Koliba and Gonzalez say this state can lead the way on emission reductions by setting an example for the rest of the country. And an analysis commissioned by VPIRG in 2014 argued that a carbon tax would spur economic development in the state, by stoking the market for locally generated renewable power. Johnson, however, says in order for a carbon tax to work, Vermonters need a viable alternative energy source. And in the heating and transportation sectors, she says those alternatives are in short supply. Legislative leaders said they aren’t opposed to a regional initiative that creates financial disincentives for consuming fossil fuels. 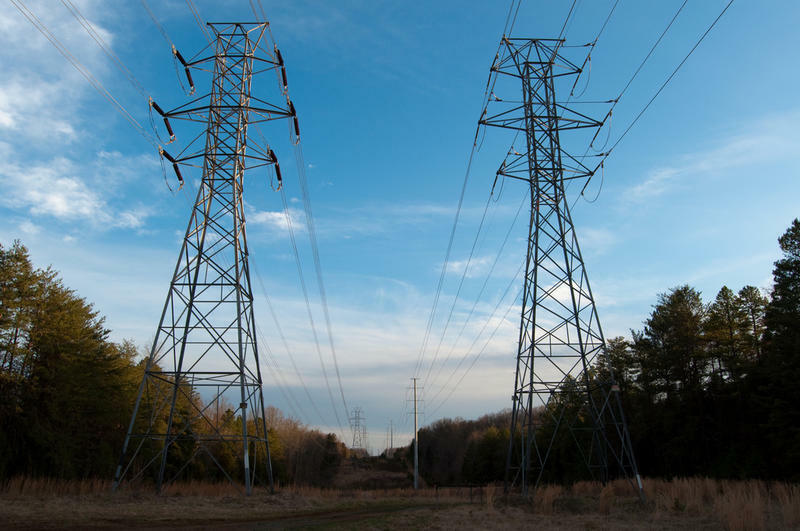 Ashe says he supports an expansion of what’s called the Regional Greenhouse Gas Initiative, a 10-state program that created a cap-and-trade system to reduce greenhouse gas emissions in the electricity sector. Ashe says he wants to expand that initiative to include other fuels, such as heating oil and unleaded gasoline. And he’s not alone: The Scott administration late last year joined a group of states that are now looking at how the Regional Greenhouse Gas Initiative could be used to reduce emissions from driving and home heating. “That to me is the single-most effective strategy to actually reduce emissions without putting Vermont at risk of a go-it-alone strategy,” Ashe says. At the end of the month, a report commissioned by the legislature will lay out some possible carbon tax options. Proponents of the concept say they’ll use those findings to chart a path forward. While a carbon tax may not be in the offing during this biennium, Gonzalez said the calls for action are getting louder. “Those folks that think that putting a price on carbon pollution is one of many things we need to do need to get in touch with their representatives and senators,” Gonzalez says. The nine-state Regional Greenhouse Gas Initiative consortium has settled on a proposed update to the cap-and-trade program that would call for a 30 percent reduction in carbon pollution from the region's power plants by 2030. Backers of the latest proposal for a carbon tax in Vermont say lawmakers can increase the price of gasoline and home heating oil without inflicting financial stress on residents and businesses.